"Gators can gallop but, fortunately, they can't climb trees." 260008OULA - This image was published in the Louisiana Life 1992 Calendar. Originally part of Cheniere Lake Park (Area 2) this area has been purchased by a local individual and sub-divided into residential lots. James and Oreatha Bond enjoy Cheniere Lake Park's camping facilities at Area 1 near the Park Headquarters. Scott and Jared Saterfiel enjoy Cheniere Lake Park for its great fishing. 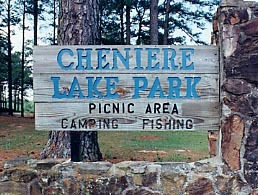 Maintained by the Ouachita Parish Police Jury, Cheniere Lake Park offers many recreational opportunities for all of the family. Cheniere Lake Park Headquarters offers air-conditioned, facilities for reunions, weddings and other functions in a scenic, rustic setting. Other facilities include open-air covered pavilions. Call 318-387-2383 for information and reservations regarding any of the facilities at Cheniere Lake Park. Tell them you found them on Ouachita.com. Bank fishermen as seen from the campground, near Cheniere Lake Park Headquarters (Area 1). The native Cypress and Tupelo Gum trees produce a magnificent autumn palette of southern color; and, if you're quiet when paddling on the many miles of canoe trails, you might meet one of Cheniere Lake Park's many native residents. "...wildcats and flying saucers. . ."? I can't tell you about the latter (they'll come get me if I do), but click on the following for a true story by a Cheniere Lake native.